Most people don’t pay much attention to the little stickers on fruits and vegetables, but for the city’s waste and recycling program, they can be a bit of a pain. Most people don't pay much attention to the little stickers on fruits and vegetables, but for Calgary's waste and recycling program, they can be a bit of a pain. 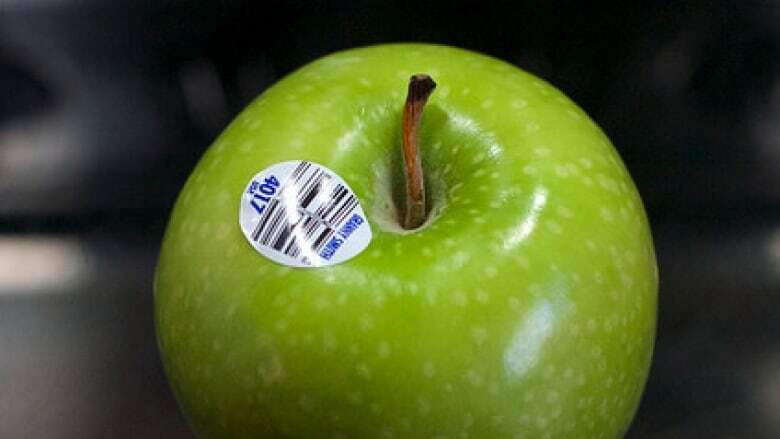 A recent tweet from the city's official account reminded Calgarians the stickers are not biodegradable and should be removed before fruit and vegetable peels and rinds are thrown in green carts to be composted. Material is screened throughout the composting process and as many stickers as possible are removed, but some still get through, says a city spokesperson. And that raises the question … why are those stickers on our food in the first place? Called a PLU sticker — short for product look up — they feature a four- or five-digit number that lets cashiers know what the product is and how much it costs. Sure it's easy to tell an apple from a grape, but it's not always easy to discern between the golden delicious and Spartan varieties of apple, which differ in price. As use of PLU codes grew, the numbers became standardized around 1990 under the International Federation for Produce Standards (IFPS). All four-digit numbers begin with a 3 or a 4 — which means the product was grown conventionally — and five-digit combinations start with a 9 (then the product's four-digit code), meaning it was organically grown. An 8 was once used to denote GMO products, but that was dropped a few years back as the GMO designation didn't affect price. Whether you're buying bananas from a store in Calgary, a shop in Kentucky or a stand in Cologne, Germany, the PLU is the same (4011). Same goes for navel oranges (3107), seedless green grapes (4022) and even passion fruit (3038 for the granadilla variety). "It's a global system," said Jane Proctor, vice-president of policy and issue management for the Canadian Produce Marketing Association. "In the U.S., in Canada, in Mexico, in the U.K., in New Zealand, in Australia, in Norway, in Sweden — in these countries, they're used all the way through the supply chain. And any other country that is shipping to those countries is also using them." When a new variety of fruit or vegetable is created that a grower or manufacturer thinks should have its own number, they can apply for a PLU (applications cost $1,000 for IFPS members; $2,000 for non-members). An IFPS committee meets electronically, four times a year, to decide which applications should be accepted and which shouldn't. The most recent deadline was Feb. 1 — there are 15 or so new products up for review right now, which Proctor called a slightly high number — and decisions are due April 30. The other application deadlines are May 1, Aug. 1 and Nov. 1 each year, with decisions due July 31, Oct. 31 and Jan. 31, respectively. The main requirement is that the product has to be sold by at least three retailers with 25 locations or more. Letters of support from the retailers are also asked for. "Not every varietal will get a new PLU," said Proctor. "We look at things like, is this commercially viable? Is it a unique varietal? Innovation in our industry is constantly happening, but not all those varietals make it to the retail shelf." There are now some 1,400 codes in use. Can you eat the stickers? The short answer is yes, says Proctor, but you probably won't want to. "They're just going to go right through you, they're not going to break down in your system," she said. "They are regulated by the health authorities in the countries, so here it would be Health Canada. If you eat them, there's absolutely no harm." The purpose of the stickers is to allow a cashier to read the code easily through a clear plastic bag, so there are some design requirements. For stickers with only a number, the type size has to be at least 14 points, and for newer PLUs, it has to include a barcode, which should be at least 10- or 12-point font. It should also have as much contrast as possible, with black lettering on a white background considered ideal. There is no maximum size for the font. Other than that, manufacturers are free to come up with their own designs, making some stickers a collector's item of sorts. Produced, made or prepared in Canada? How important is it for Canada to produce its own food?